You may have noticed new color-coded status indicators down the left column of the Asset list. These indicators provide a quick visual confirmation of the overall current status of the service schedules for each asset. You can open an Asset record to get more details about individual service schedules. 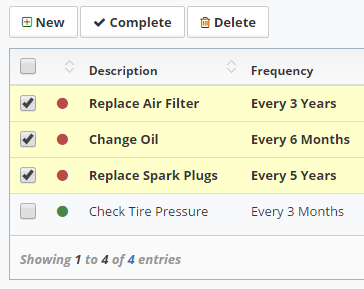 How can I schedule recurring service? Click the "New" button on the Asset Form - Service Schedule. Select a Service Item or add a new one. Set the frequency for how often to repeat the service, or set it to one-time only as needed. Click the "Save" button to save the new schedule. How can I log completed service? The Service Log keeps track of all completed service. Click the "Service Log" toggle button on the Asset Form - Service tab. Click the "New" button and then Select the Service Item or add a new one. Fill in the Service Date and any notes as needed. CLick the "Save" button to save the service log. Note: if you have a schedule set up for this item, you can also add a new service log entry automatically by checking the box for the service schedule and then clicking the "Complete" button. This can be used to Complete several items all at once. How can I get a complete list of the service due for all Assets? Use the "Upcoming Service" report to find what's due for service in the next 30 days.